As a photographer, I create thousands of images a year. There are some that just grab my heart and won’t let it go. This is one of them! 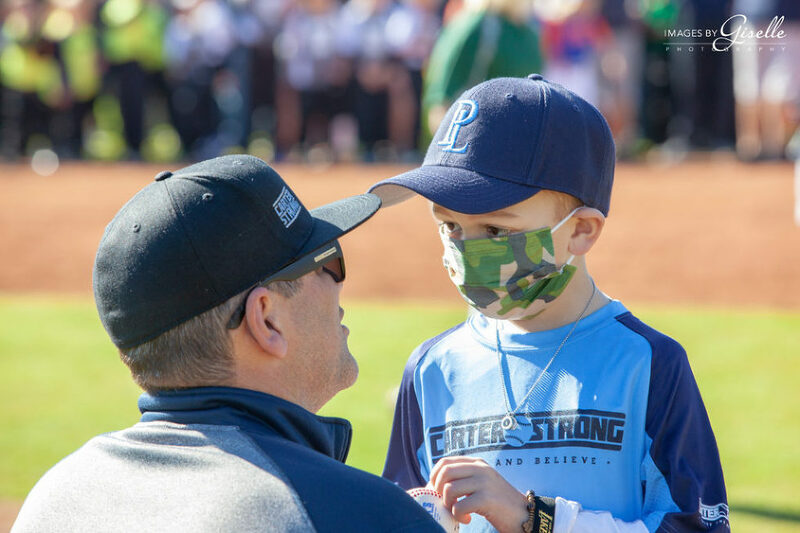 Carter, who is fighting Leukemia, walked to the mound at the Point Loma Little League Opening Day ceremonies to throw out the first pitch but with all eyes on him, I’m sure he felt a little nervous. That’s when his dad, Jason, knelt down and looked at him eye to eye. I’m not sure exactly what was said but I am sure of one thing – it was full of love, pride, and encouragement. That’s all Carter needed to stand tall at the mound and throw out an amazing pitch! Read more about Carter and help fight the fight at 2019 Celebration of Champions. I had the honor of being asked to photograph a very special day at the Point Loma Little League fields. This year’s Opening Day ceremonies were going to be honoring a 5 year old warrior! Carter Santos is fighting and crushing his battle with Leukemia. He was diagnosed in December and has had quite the journey. All of Point Loma and especially his friends at PLLL wanted to show him how much he is loved and supported. The first idea was that we would create an image like the top one in which we would place his honorary team front and center and photograph all the participants. This was to be a surprise gift to him to let him know that he was in everyone’s thoughts. Well, we were all touched when Carter was able to make it to the ceremonies. He had a few good days that gave him the energy and excitement to be a part of the day. Not only did he get to watch the ceremonies from the score shack but he was able to come down to the field and throw out the first pitch! Way to go Carter!!! Great things come to those who wait… After numerous reschedules due to illness, weather, and random, unexpected circumstances, I was finally able to meet up with this beautiful family! The love they share with each other was so just so heartwarming. I left the session not only knowing that we had captured some great moments together, but that the moments we spent together had touched me in a way that left me light on my feet and smiling all the way home. Amazing family both inside and out! Thank you for the special afternoon we spent together!